Due to space constraints this article will ONLY cover the treatment of borrelia, the causative agent of Lyme Disease. To see treatments for the various co-infections, type Bartonella, Babesia, Mycoplasma, Parasites, Toxoplasmosis, or Powassan Virus into the search bar for those articles. I hope to add to this list in the future. Please know a tick’s gut is often filled with numerous pathogens with the potential to infect you with only one bite: https://madisonarealymesupportgroup.com/2017/07/01/one-tick-bite-could-put-you-at-risk-for-at-least-6-different-diseases/ (The actual number is 18 and counting) This is an important overlooked problem as many of these pathogens will not respond to doxycycline – the drug of choice for most uneducated general practitioners. Lyme Disease or borreliosis is caused by a Gram-negative bacterium belonging to the class of Spirochaetes, which have flagella allowing it to migrate through fluids and burrow through tissues, making it highly invasive. Borrelia burgdorferi is known for its outer surface proteins OspA and OspC which have a role in transmission into the host cell, whose metabolism is limited requiring Bb to rely on its host for energy precursors. Bb is slow growing, with a doubling time of 12-18 hours, unlike Strep or Staph which doubles every 20-30 minutes, which factors into the difficulty of diagnosis. This also necessitates longer treatment time for Bb as most antibiotics kill bacteria only when they divide. There are at least 37 known species, 12 of which are Lyme Disease related to date, and an unknown number of genomic strains; however, these numbers are constantly changing due to greater strain diversity than previously thought. Further complicating things, the strains differ in clinical symptoms and/or presentation as well as geographic distribution; however, again, to put Bb strain diversity into a geographical box is a huge mistake as the bird, reptile, fox, rodents, and humans are never confined to one location and migrate freely. Further complicating things, borrelia exists in three different forms. These are the spirochete, L-form (lives in cells), and microscopic cyst form or non cell wall. The form can change shape whenever it feels threatened and can lie dormant until conditions are beneficial. http://norvect.no/230-peer-reviewed-studies-show-evidence-of-persistent-lyme-disease/ Despite the denial, here are 230 studies showing borrelia persistence. 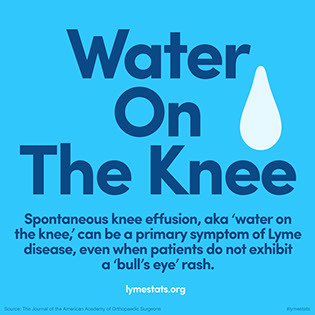 Lyme Disease (LD) is the most common vector borne disease in the U.S with the CDC estimating that there are at least 300,000 new cases of LD diagnosed yearly, with actual infection rates much higher. Testing, by the way, is abysmal for ALL Tick borne infections including Lyme: https://www.lymedisease.org/lyme-basics/lyme-disease/diagnosis/ Current testing doesn’t measure actual pathogens but antibody response to infection. They also are blood tests which are problematic due to borrelia’s preference for tissues to evade the immune system. The CDC’s current two-tiered testing (ELISA followed by the Western Blot) is highly insensitive. The fact that over 300,000 new cases a year are recorded bely the fact that these arbitrary and stringent tests miss over half of all cases. It’s a no-brainer that actual infection rates are much higher. This makes LD more prevalent than AIDS, breast cancer, West Nile Virus, H1N1, and Ebola. http://www.medicaldaily.com/lyme-disease-contagious-clues-hint-it-may-be-sexually-transmitted-disease-267964 . There are over 300 strains of Bb worldwide and 100 strains in the U.S. to date. Please note that the current two-tiered testing only uses ONE strain. To get a positive would be akin to winning the Lotto. It has since been determined that Lyme disease (named for the town in which it was first identified) can be caused by any number of different species in the genus Borrelia, such as: B. andersonii, B. japonica, B. valaisiana, B. lusitanie, B. turdae. B. tunakii, B. bissettii, and B. lonestari, and the most recent discovery of B. mayonii. https://www.youtube.com/watch?v=ow53uy1qElI (Approx 50 min) Excellent video explaining the horrible testing, possible biowarfare agents including Lyme Disease (Bb), lab workers becoming infected at work, Plum Island’s work with ticks, the anti-trust investigation with testimony at 18:50 by Dr. Phillip in case after case for persistent (chronic) Lyme, at 35:30 clips of pathologist Alan MacDonald who’s getting 100% positive Bb in autopsies of Alzheimer patients, testimony of a woman who miscarried due to Bb, and much more). Due to this brave man’s actions, the CDC changed their position on transmission of Ebola. The box of myths the CDC, NIH, and ISDA has conveniently thrown all of the factors of this complex illness(es) into are already beginning to claw their way out with a new species of Bb and Bartonella being “discovered” just this past week. I predict much more yet to come. If you have a preponderance of symptoms it’s highly likely you are infected. Take this with you to your doctor appointment. https://madisonarealymesupportgroup.wordpress.com/2015/08/15/herxheimer-die-off-reaction-explained/ as well as the article, Tips for Newbies. FOR EDUCATIONAL PURPOSES ONLY. PLEASE DISCUSS ALL TREATMENT OPTIONS WITH YOUR HEALTH PROFESSIONAL. A successful treatment should treat all three forms of borrelia. There is disparity between LLMD’s as to the timing of this but many state you should treat all three forms at the same time. However, at the first treatment take care to avoid an intense die-­off reaction by starting one prescription antibiotic only. Too much inflammation is unhelpful. LLMD, Ken Singleton states there are five classes of antibiotics commonly used for Lyme Disease (borrelia). Tetracyclines are commonly used due to their ability to penetrate cell walls. Both of these must produce high blood levels and may require monitoring. If they are not tolerated due to side effects, doxy may be administered intravenously and the dosage for that is 300-400mg once a day. Macrolides and Ketolides, similar to Tetracyclines penetrate cell walls and tissues. *Blood tests are needed to monitor liver function and white blood cell count. *Macrolides can interfere with other drugs. Make sure to talk to your doctor and pharmacist about other medications you are taking prior to beginning macrolide treatment. Cephalosporins ideally should be combined with antibiotic classes that target the L-form of borrelia and, ideally, the cystic form also. Rocephin (IV) 1-2gms every eight hours and Claforan (IV)- 2gms daily – high blood levels need to be reached and levels should be measured regularly. *Regular blood testing should be done to detect any adverse reactions. Ceftriaxone can cause gallstones, which can be prevented by using ursodiol. *People allergic to penicillins are also allergic to cephalosporins. Penicillins also should be combined with other antibiotic classes that target the L-form (such as macrolides & Ketolides) and cystic form (Metronidizole). amoxicillin (1,000-2,000mg every eight hours) sometimes combined with probenecid (500mg) or Augmentin helps to keep blood levels high. Metronidazole kills borrelia in the cystic form. Use in combination with one or more of the above classes to kill all three forms. Tinidazole does this as well. Please see Dr. Eva Sapi’s work: https://www.dovepress.com/evaluation-of-in-vitro-antibiotic-susceptibility-of-different-morpholo-peer-reviewed-article-IDR Metronidazole led to reduction of spirochetal structures by ~90% and round body forms by ~80%. Tigecycline and tinidazole treatment reduced both spirochetal and round body forms by ~80%–90%. In terms of qualitative effects, only tinidazole reduced viable organisms by ~90%. Following treatment with the other antibiotics, viable organisms were detected in 70%–85% of the biofilm-like colonies. According to Ross, a successful borrelia treatment needs to boost the immune system, kill the infections, protect and repair the negative effects upon the body, and speed recovery. He recommends staying on each of the natural medicines until you have marked improvement, then you can stop all naturals but probiotics, curcumin, ashwagandha, and a good multi-vitamin. Prescription: Zolpidem (Ambien) 10mg 1 pill 30 min before bed (use if you have trouble getting to sleep as it is short acting), and/or Clonazepam (Klonopin) 1 mg .5-2 pills 30 min to 1 hour before bed. (use if you have trouble staying asleep). If you have both getting to sleep and staying asleep issues, try Ambien first. Ashwagandha 400mg 1-2 pills am and 1-2 pills between 1-2pm. Taking late will disturb sleep. HORMONES: A person could have normal range testing for each of the hormones but still have clinically low hormones. Because of the unreliability of testing, treatment for low hormones should occur if there are clinical symptoms of low hormones as long as treatment does not increase hormone levels above the upper end of normal. Hormones provide many functions in the body. Proper levels improve energy and help the immune system to work more effectively. Symptoms: fatigue, recurrent infections, poor recovery from infections, low blood sugar with shakiness and irritability relieved by eating, low blood pressure and dizziness on standing, afternoon crashing, and sugar cravings. Prescription – Cortef 5mg 1-2 pills am and 1-2 pills from 1-2pm. Taking late will disturb sleep. Symptoms: Low thyroid: fatigue, achiness, low body temperatures averaging below 98.0 F, cold intolerance, weight gain, constipation, and changes in menstrual periods. Prescription – Desiccated Thyroid 1/2 grain or Armour Thyroid 1/2 grain. 1 pill in the morning 30 min before anything else but water (empty stomach). Increase every 3-4 weeks by 1/2 grain if low thyroid symptoms persist. It has been my personal experience that most general practitioners do not think for themselves when it comes to hormones. Similarly to how they hide behind the CDC guidelines, they hide behind test results and refuse to diagnose and treat patients clinically. Multivitamin: Use a vitamin that has numerous amino acids, antioxidants, minerals, and various vitamin Bs including b12 and folate. He prefers vitamin powders from Thorne and Integrative Therapeutics. Probiotics – use a product shown to repopulate the intestines in scientific studies. Take at least 10 billion live cultures 1 hour away from antibiotics. During an active yeast infection consider increasing to 20 billion cultures one time a day or divided in to two doses. Natural medicine: Herbal Combinations. 2 pills 2 times a day. (Common herbs found individually or mixed together include: pau d’arco, caprilic acid, rosemary oil, thyme oil, garlic, and grapefruit seed extract.) Will take 3-4 months to get yeast overgrowth under control. Prescription medicine: Nystatin 500,000IU 2 pills 2 times a day. *You may add Fluconazole (Diflucan) 200mg 1 time daily for 30 days combined with nystatin for prevent drug resistance for a yeast overgrowth problem. Otoba Bark Extract and Cat’s Claw 5 drops 2X/day of each and increase every 2 days by 1 drop per dose till taking 30 drops 2X/day. Take on an empty stomach. Do not take 30 min before through 2 hours after having food, medicines, or supplements. If you Herx, do not advance dosage until it decreases. *Both of these antibiotics treat the L-form and the spirochete form. Remain on same as they kill all 3 forms of Lyme. Work with LLMD to add additional antibiotics to treat all 3 forms of Lyme. You need to add an antibiotic to kill the cyst form of Lyme. 2-3 servings of beans, legumes, or whole grains/day. Fiber helps you detox. Combine antibiotics to address the 3 forms. Use enzymes to address biofilms, and continue until patient is symptom-free for 2 months. amoxicillin (500-875mg 2-3X/day) with probenecid 500mg 1X/day with meals. He states to check the peak (12-15 is optimal) and trough levels which may necessitate increasing the dose. Avoid probenecid if there is a sulfa sensitivity or use with caution if has kidney stones. Augmentin (875-1,000mg 1-2X/day) alone or with amoxicillin. IM Bicillin 1.2 million units 2-4X/week. Use Emla or lidocaine cream 1 hour prior to injection & massage area 2-3 minutes after and repeat several times per day. IV Rocephin (2g daily 5-7days/week, up to 2g every 12 pulsed 4-5 days/week). Use Actigall (300mg) 1X/day to prevent sludge and gallstones. Check CBC and CMP with liver functions every two weeks and use liver support (NAC, ALA, Hepa #2, milk thistle) as necessary. IV Claforan (2g every 8-12 hours) may used instead of Rocephin if there are gallbladder problems. Check blood work as with Rocephin. Zithromax (250mg 1X/week with meals. *Advise patients of tendon issues and do not exercise vigorously. Discontinue if tendon pain starts. Take ALA, curcurmin, and magnesium to decrease side-effects. *Consider pulsing these in 5 day cycles to reduce tendon damage. Rifampin: (150mg to 300mg 2X/day) Do not use if pregnant. Use with another intracellular to avoid resistance. Dr. Horowitz has recently added Mycobacterium drugs (used for leprosy) on his most treatment resistant patients: https://madisonarealymesupportgroup.com/2016/10/09/mycobacterium-drugs-for-ld/ Horowitz reports that the Dapsone and PZA protocols have been the most effective treatment additions for resistant Lyme and autoimmune symptoms, with PZA being the most effective for dermatological manifestations of Bahcet’s and arthritic/granulomatous changes. For an excellent interview with Dr. Horowitz: https://on-lyme.org/en/sufferers/lyme-stories/item/255-is-there-hope-for-lyme-patients-interview-with-dr-richard-horowitz Takeaway: I do not have to put a PICC-line in or use IV ceftriaxone in many of these people because the dapsone protocol combined with doxycycline and rifampin is turning out to be an excellent protocol. It gets good penetration into the central nervous system. Many of my patient’s symptoms are getting better with this protocol, including resistant fatigue, joint/muscle and nerve pain, memory and concentration problems, as well as their sleep and mood disorders. http://www.immed.org/treatment%20considerations/LymeTickTwnsndLet2007.285.93.98.pdf An excellent PDF with treatment suggestions from Dr. Garth Nicolson. Please remember that you can jump immediately to late disseminated Lyme without noticing any of the previous stages and while the literature often categorizes these stages with time frames, it is often the case that reality is far different. He also goes into co-infection treatment as well. This herbal program utilizes 14 different Nutramedix products including 6 Microbial Defense herbals that are taken rotationally over at least 6 months. Richard Horowitz, MD in New York State has found the Cowden Support Program to be effective in markedly improving the condition of 70-80% of the advanced Lyme Borreliosis patients with co-infections over 4 to 6 months’ time, even if the patients had previously failed to improve on multiple courses of antibiotics. Cat’s claw (Uncaria tomentosa) Raintree brand, 1-4 tablets 3-4X/day for 2-3 months, then 2-3 capsules 3X/day or for tincture dosage: same as knotweed above. Eleuthero (Eleutherococcus senticosus) HerbPharm tincture, 1/2 to 1 tsp upon rising and at lunch for all weights. Ashwagandha (withania) 1,000g at night before bed for sleep issues and brain fog. If you have questions, you may post them to Stephen at: www.PlanetThrive.com/category/experts/buhner/. I highly recommend all of Stephen’s books. Recently, work is being done on essential oils. https://madisonarealymesupportgroup.com/2017/10/13/oregano-cinnamon-and-clove-found-to-have-high-anti-persister-activity-for-bb/ While this is potentially great news for patients, please remember this was all done in vitro (in a test tube), similarly to the work on Stevia. Also, we have no idea what dosage would be effective or safe for human consumption. As to the work on Stevia, again, it’s all in vitro and needs to be proven in humans. Ozone Ten-pass: https://madisonarealymesupportgroup.com/2017/12/04/ozone-ten-pass-lyme-msids-treatment-in-ca/ Infusing ozone into the blood is being used with some success. It will kill all pathogens – including viruses in the blood. As to duration of treatment – this varies highly; however, according to the most experienced Lyme literate doctor in the state of Wisconsin, treatment cases in the 70’s resolved within a month to a year, while current cases are taking three and more years. Many LLMD’s (Lyme literate doctors) recommend a maintenance program for life. I know this is overwhelming. Take a deep breath and put one foot in front of the other. One day at a time. Trust me, before long you will be a quasi expert in all things TBI (tick borne infections). You do need to get to an LLMD (Lyme literate doctor). Regular practitioners at this point do not believe in the severity and complexity of MSIDS (multi systemic infectious disease syndrome or Lyme with friends). They will not treat you properly with various and extended antibiotics and/or naturals. Research shows that most are infected with more than borrelia, the causative agent of LD, and have various coinfections such as Bartonella and Babesia complicating our cases. According to Horowitz, research shows that a person with both Babesia and borrelia are three times sicker than if they just had LD. This is important to acknowledge and frankly, most GP’s are clueless on all of this. These stealth pathogens are experts at fooling your immune system and they work symbiotically together and actually morph inside your body by changing their outer surface proteins to be different than when they entered. Realize you have a lot to learn. Learn it. Then, be your own advocate. This is not going to be a sprint, and it’s far from fun. It’s going to be a marathon, so strap yourself in for a wild ride. If you are able, get to a Lyme Support Group to learn and be around others on the same journey. We learn from each other. If you aren’t able to get to a physical support group, I highly recommend getting on an on-line support group. You can ask questions and read others’ experiences. On the right hand side of the website, scroll down until you see “On-line Support Groups.” Click and join. Also, if you want to receive an email each time I post educational materials or meeting times for the Madison Lyme Support Group, pop me an email, I’ll send you an invite, and you will get an email directly to you when I post. This is convenient because I always send reminders for meeting times! You can also type in words in the search bar for articles to help you learn. For instance, from here, I’d recommend “Tips for Newbies,” as this complex is far different than anything you’ve experienced. Also, if you are struggling with cognitive and/or psychological issues, please type “Psychological Aspects of Lyme,” into the search bar. No, you aren’t crazy, you have a brain infection which makes you feel crazy. Treatment will resolve these issues.